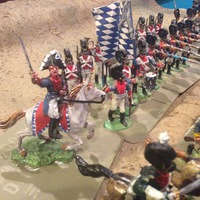 HaT napoleonics form the bulk of my thousand figure set of 1/32 figures for the Blucher rule set. Sixteen soldiers on two standard beer coasters make a brigade. 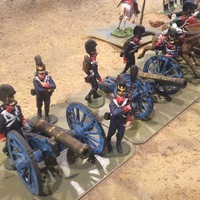 3-4 brigades with attached cavalry and artillery make up a corps. 3-4 corps make an army. The group I game with did "Almost Hanau" in an 1813 scenario. The French squeaked just enough of their shredded units over the bridge before the Prussians and Russians could finish them off. 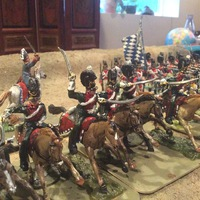 The hardest part of 1/32 armies is all the cutting and modifying required for cavalry. Think I've purchased a dozen sets of HaT dragons just to get decent horses! Not my scale but very impressive stuff indeed.